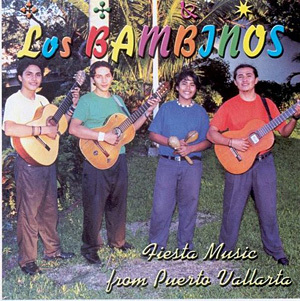 In 2003 Los Bambinos produced their first CD, Fiesta Music from Puerto Vallarta. The band's second album, Los Bambinos Salute The Beatles was released in 2005. 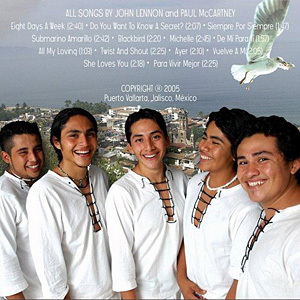 In 2002, when Carlos Morales Salinas left Luz de Luna, the group with whom he had been singing, to start a new group with his 3 younger brothers, Lazzaro, Immer and Giorgio, they needed a name. We all tried to come up with a name and then Carlos said that his father had always called them "his bambinos" and everyone liked that, so they decided that Los Bambinos was a great name for their group. In 2003, the group produced their first CD, Fiesta Music from Puerto Vallarta and in 2005, Los Bambinos Salute The Beatles. Both have been best sellers here in Puerto Vallarta. While working on their last CD, Luis Alberto Leana Salinas came to visit, started singing with his cousins, became a vital part of the group and never returned to his home in Morelos. But now this group, voted Puerto Vallarta Reader's Choice "Best Musical Group" in 2006 and with two sold out seasons of concerts at Puerto Vallarta's premier venue The Santa Barbara Theater, was ready for the next step. Blaine Selkirk, producer and director of their concerts and their soon to be released new CD, quickly found that Los Bambinos was already in use and they would have to come up with a new name. So all put on their thinking caps to come up with a new name. Nothing seemed right. Then, Immer suggested an acronym using the last names of their father and mother. So from Morales Salinas he suggest Morsa. No one was excited about Morsa, but couldn't find another that seemed just right. One afternoon sitting on the shady patio at Blaine's beautiful home, all of us began to brain storm. Everyone was coming up with versions of Morsa and when someone said "Metamorsa," everyone stopped talking because they thought it sounded just right - even though it really didn't mean anything. I liked the fact that it suggested a metamorphosis as that was certainly taking place with Los Bambinos. After a quick check of the public domain and a unanimous vote, Metamorsa was born. The young men and Blaine have been working since November 2006 on a new CD of their original music. Carlos and Luis have been writing music for several years and now Lazzaro, Immer and Giorgio were getting into the act. You aren't going to believe the incredible music they have written or the arrangements Blaine has made for them. As their number one groupie, I often go out to Ancient Sun Studio (Blaine's state of the art recording studio) to sit in on the recording sessions. What a blast! As most of you know, Blaine doesn't speak a lot of Spanish and the guys don't speak a lot of English, although that is rapidly changing as each is learning more and more of the others language. Anyway, they communicate perfectly through the language of music, some translations by me and their mutual dedication to this project. I have often used the word, "magic" when speaking of Puerto Vallarta and I have to tell you that what is happening out at the studio is nothing short of magic as these boys are morphing into professional performers the likes of which you see on TV and hear on the radio. Now that the CD is almost completed, Blaine wanted to do a short video of the guys singing one of the songs. This was an idea the guys and I had several years ago and I had even contacted Laura Gelezunas of Video Diva Productions to discuss it. In fact, I invited her to a party we had where, of course, Los Bambinos were performing. She was impressed and thought she could do it. Then things intervened for her and for Los Bambinos and a video was put off. So when Blaine told me he had contacted the Video Diva to shoot the video he wanted and I found that it was Laura, I thought that had to be a good omen as I had not mentioned her to him. Last weekend, thanks to the generosity of Ed Hutmacher, we all gathered at The Santa Barbara Theater to rehearse, get the lighting right, etc. I was there despite the fact that Husband, the love of my life, was at CMQ Hospital recovering from the pneumonia he contracted during a visit to Kentucky and Virginia a few weeks ago. Husband is as big a Metamorsa fan as I, and since he was getting the unbelievable attention given to patients at that hospital by doctors, nurses, helpers and even passers-by, he sent me off confident everything would be OK.
After what I deemed a grueling rehearsal with the guys under those hot lights belting out "Volar" over and over again until Blaine and Laura thought everything was perfect, they broke and I hotfooted it back to CMQ and Husband who was peacefully entertaining some of our many friends who came to look in on him. The next day was the real thing. It was just like it was when Husband and I were extras for the TV series Acapulco Heat. Hurry up and wait! But Blaine and Laura had things pretty much in hand and the taping went very smoothly until Blaine yelled at Lazzaro, "Take off your shirt!" Lazzaro knew exactly what he was saying, but gave him a puzzled look and a "¿Como?" Blaine, who has very little patience at times, repeated the order a little more emphatically and off came Lazzaro's shirt. Well, you may not know it, but Lazzaro runs, works out daily at the same gym Husband and I use and he has a sculpted body that can make even this 75 year old gal gasp! They taped him playing his guitar shirtless and I busily snapped some stills for posterity. After that episode, things moved briskly with Laura sometimes on a ladder, sometimes lying flat on the floor and sometimes right in their faces. It was a very professional shoot as evidenced yesterday when Blaine showed us the edited and finished video. Wow! Did they ever do a great job! There is no doubt in my mind that when he takes that CD and video to the powers that be in Mexico City, Metamorsa is going to come out with a record contract and a touring schedule - and we can all say we knew them when! Polly G. Vicars and her husband of 55 years, Hubert (a.k.a. "Husband") retired to Puerto Vallarta in 1988 and soon became active members of several charitable organizations. Polly is the author of "Tales of Retirement in Paradise: Life in Puerto Vallarta, Mexico" [a sell-out!] and "More Tales of Retirement in Puerto Vallarta and Around the World." Proceeds from the sale of her books go to the America-Mexico Foundation, a scholarship foundation that is their passion. Click HERE for more articles by Polly Vicars.